. . .The knees are retained in their proper curvature by cords around the ends. After a sufficient number of them have been placed upon the keel, two poles of suitable dimensions are heated, bent around the ends for a gunwale, and firmly lashed to each knee. Smaller willows are then interwoven, so as to model the frame. Green or soaked hides are cut into the proper shape to fit the frame, and sewed together with buckskin strings; then the frame of the boat is placed in the middle, the hide drawn up snug around the sides, and secured with raw-hide thongs to the gunwale. The boat is then turned bottom upward and left to dry, after which the seams where they have been sewed are covered with a mixture of melted tallow and pitch: the craft is now ready for launching. Since we’ve returned from our trip west I’ve been reading about what life was like traversing the wilderness in 1859. ‘The Prairie Traveler’ was an intriguing look into the past with all its dangers, struggles, misconceptions, and experiences. The bravery of the pioneers who set off westward in a Conestoga wagon during the second half of the 19th century is greater than I have known. I greatly admire their courage and fortitude, even more so since having read The Prairie Traveler by U.S. Army Captain Randolph B. Marcy. 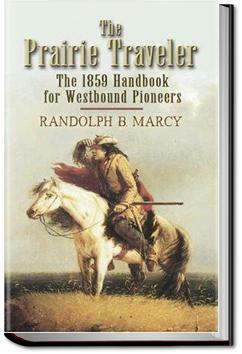 The Prairie Traveler was written by Randolph B. Marcy, Captain US Army for the use of settlers as they crossed the Great Plains in the middle of the 19th century. This had a good amount of technical advice, some of it dubious, especially when it came to snake bites and disease prevention. The itineraries for the trails are fairly well detailed, it would be very great to bring this book along for a roadtrip out west. This is a Dover reprint of the original publication of the handbook many pioneers swore by as they headed west across the United States in the nineteenth century.